In the waning minutes of their opening World Cup match against powerhouse South Africa in September, Japan was trailing by three points. With play entering injury time, the game could end any second yet Japan declined the opportunity to kick a game tying penalty and instead opted to to enter a scrum for a chance to win (or lose) the game. For those of you that do not know rugby, the scrum is likely the image you are most familiar with. Eight players from each team pack together to fight for control of the ball. It is a test of strength, patience, technique, and resolve. Japan won the scrum and took the ball back despite being smaller, weaker, and less experienced. They then went on to win the game. Japan’s comeback and win was universally described as the greatest upset in World Cup history. They finished the tournament with three wins; not bad for a team whose only win in 24 previous World Cup games came way back in 1991. Watching the game you immediately knew that Japan was doing something right in their coaching and physical preparation. Much of the credit goes to head coach Eddie Jones, who Vern Gambetta wrote about recently in a two part series. Last week Jones became the first foreigner to assume the role of head coach for the England squad. Much of the credit also goes to their lead strength and conditioning coach John Pryor. When I heard he would be traveling through Switzerland after the World Cup I wanted to pick his brain about their approach. Pryor comes from an athletics background, having competed in the throws and sprints in high school (among other sports). 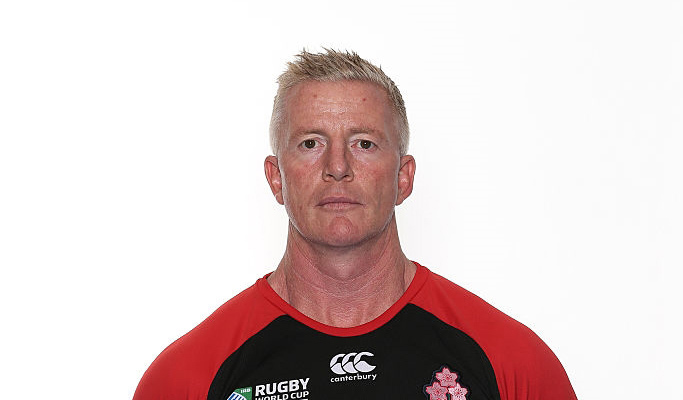 After working on a PhD in biomechanics, he slowly found his way to rugby and for the past decade he has been working at the highest levels of rugby, coaching for the Australian national squad, the Brumbies of Super Rugby, and now Japan since 2012. I knew his background before we met, but I didn’t know how mind blowing our meeting would be. In our discussion we talked about his athletics influence, how he worked to implement the work of Frans Bosch in rugby, and the role of general and specific training in Japan’s success. Martin: One of the things that interests me the most in Japan’s preparations for the World Cup was the use of specific training methods. As a hammer thrower it is quite easy to implement specific training since I have to execute one movement and that never changes. But in rugby you are never truly in the same situation position twice. How did you go about develop such a specific system based on a sport that is so complex? John: As a rugby player what I ideally want is to run in such a way that I have options: I can change direction, I can pass, I can kick, or I can run at high velocity into contact. Having all those options available to you threatens and manipulate a defense. Several years ago I developed the idea that physical superiority could only be based on superior acceleration and acceleration consistency (i.e. specific fitness) for the Japanese team, as we are a very small team. I read Frans Bosch’s book several years ago and I thought he was the best guy we could bring in to get involved to develop more specific training systems. Together we developed for the backs a combination of running and skill at high speed. The big difference with his influence was that rather than speed and agility drills that done are through pre-programmed pathways, we worked on the concept he calls “options.” We want to consistently run well and have all options available (i.e. step, pass, carry into contact). If I am running with my legs trailing behind me, for example, I don’t have those options. All I can do is make a loose pass to the outside and the defense can anticipate that, or carry weakly into contact. Martin: How did you then take the options concept and train athletes to be in those positions? Chest up creates better abdominal tension, and better force transfer and resistance to contact. And it creates the optimal conditions for better passing. If the chest is not up I cannot deliver a ball out the back or I can’t provide strong contact, so more options are lost. If the chest is down and the torso is flexed and weak, then we cannot generate the right tension for good passing or optimal contact outcomes. Foot from above means that if the leg action is trailing behind and the foot is coming to the ground from behind I can’t present the force for a lateral step and then one option is already gone. 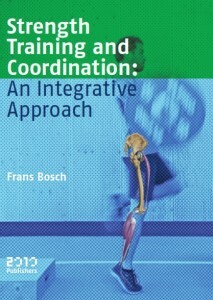 Learn more about Frans Bosch’s integrated approach to strength and conditioning in his new book. Then we tried to create drills that reinforced those two things. In our gym we had 20 to 30 meters indoors with wrestling mats and then I would throw 4-centimeter rubber mats randomly on the floor. The variation of the ground surface meant that they might be stepping on the mat or off the mat. If you are running with the wrong leg action over undulating ground you will trip over and fall on your face. We would make them sprint down the mats and throw a rugby ball or a heavier aqua ball weighing one to five kilos. It is physically impossible to execute that drill without those two features. We did heaps of variations of those drills. I would have the backs race in pairs and have to make these passes. We would use regular rugby ball and aqua balls of various weights, to really stress this creation of core tension. In this way we moved from teaching drills and giving feedback, to developing new drills where the success or failure of the drill is feedback in itself. It moved from extrinsic to intrinsic feedback. Their feedback was if they fell over or moved fast. Or if they were unable to make the pass at speed, then they probably did not create the necessary core tension. So the players effectively “teach themselves” once these drills are created. Martin: The unpredictability of the drill then helps athletes prepare for the unpredictability of the game. What are some of the other variations you used. John: One of the things Frans said to me is that for the most part, in speed and agility training, athletes are so under stimulated. We were just teaching single pre-programmed movements. Anyone can do run between two flags. There might be variations in how fast you can do it, but we wanted to develop a more flexible responsive skill set in our players. We wanted to develop fast reactions and fast movements in small spaces. When you are not training in a high speed and highly reactive way, you will never go to the limit because you haven’t trained with the confidence to know that you can put the pass away, so you pass it much earlier. The more work we do in the high velocity highly reactive zones make our players more confident at playing close to the opposition defensive line. → Related content: learn about Bosch’s concepts of reactivity training in our training talk with hurdles coach Gary Winckler. Martin: It’s interesting then since it not only increases your specific strength or ability to execute certain skills, but as a result as then changes the whole nature of the game play. John: Rugby defenses are so highly organized that you have to make sure the defender does not know what you will do next. If you are running fast and leaning forward, you know I can only make a pass or fall forward. Therefore I will not attract more than one defender. But if I come in with the right features you know a pass could go one direction or I could step the other direction. Defenders can sense from my body position that I have those options. Then we start to manipulate the defense once we acquire those physical skill sets. That was Frans’ biggest influence on me. We lost our obsession with linear 20-meter and 40-meter speed. I didn’t have quick guys in the first place; you need some wingers possible of reaching 10 meters/second to finish plays. Our guys were running 8.5 m/s and we were able to get them up to 9.5 m/s, which was good enough if they kept the options. And we did that without any sophisticated approach to linear speed. The options project was more significant because we looked not just at linear speed but catching, passing, and agility speed. Continue reading part two, where Pryor discusses his approach to periodization, transfer of training, and more.